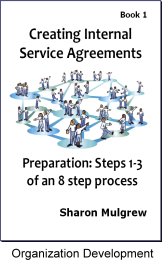 In this resource you get the step-by-step skills and support you need to prepare yourself to engage in respectful and reasonable service partnering agreements. 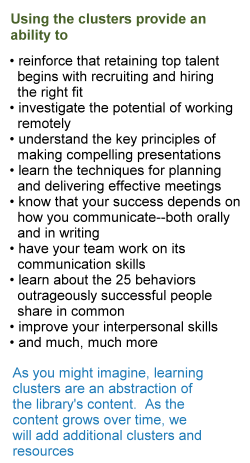 You learn to assess the current level of collaboration in your organization; to hold an effective launch meeting; and to identify your essential contribution to your organizational network. In Step 4, you will develop preliminary documentation that provides you, your employees, and your service partners with a clear picture of your department's role and operating parameters. In Step 5, you discover what your internal customer needs from you. This gives you the accurate information you need to draft your internal service agreement. Step 6 gives you an "all cards on the table" strategy that helps you to negotiate a true partnering relationship. 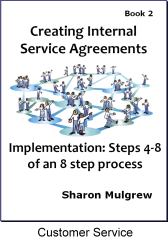 Step 7 shows you how to create and negotiate your formal internal service agreements including how to measure effectiveness, deliver unexpected services, resolve conflicts, and identify future changes. In Step 8, you learn how to set up an effective review system for your Internal Service Agreement to keep it alive and effective. By putting Creating Internal Service Agreements - Book 1 and 2 into action, you and your internal partners (customers and suppliers) will be more productive contributors to the overall effectiveness of your organization. 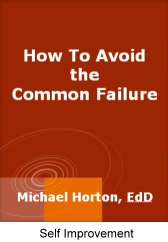 Identify five specific kinds of common failure. Learn specific skills to overcome or avoid these failures. Be introduced to key concepts that will help you better understand the nature of some failures. Learn how to manage situations in which you encounter a paradox. Assess your thinking patterns and consider ways to refine them. Consider how you typically perceive and interpret situations. Learn specific skill to listen actively. Focus on positive events in the workplace. Identify the purpose and meaning of their jobs. Be proactive in arranging events and conditions that help them to get engaged and stay that way. Tell the difference between controlling events and influencing them. Take ownership of their feelings of disengagement and allow engaged feelings to dominate. 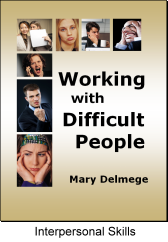 We all run into difficult people at work and this book provides a fresh look at dealing with them more effectively. The book explains what causes people to behave poorly and offers an analysis of four difficult personality types, along with strategies for working with each of them. The book is based on the philosophy that each of us is accountable for our behavior and its consequences. Clear communications and specific goals are essential for resolving difficult situations and this book offers proven techniques that you can put into practice immediately. 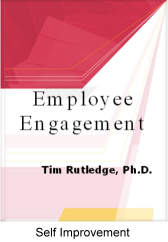 Using examples drawn from actual work situations, the author provides practical guidance and easy to understand techniques. She shows you how to implement a six-step process for managing your encounters with difficult people more productively.